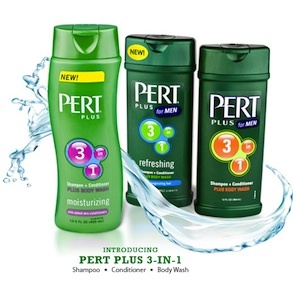 On Checkout 51’s list this week (Sept 19-25, 2013) is Pert Plus shampoo and conditioners, Any variety, excludes travel size. Shampoo plus conditioner plus body wash in a moisturizing formula with added skin conditioners that lathers rich and foamy. Gentle cleansing for everyday use. You will get $1.00 cash back rebate at Checkout 51. Here’s a pic of what it looks like. I found a couple prices of it at a few stores.